The European Union has been urged to revamp its current partial ban on the sale of smokeless tobacco products. An alliance of researchers and anti-tobacco activists says some products - including forms of snuff - which might help people quit smoking are banned. However, others, such as chewing tobacco from India, which are highly toxic, are not. The research, published in the journal Tobacco Control, calls for new rules to ban the most harmful products. It stresses that no form of smokeless tobacco is completely harmless. But it says that some products, in particular a Swedish form of snuff called snus, are considerably less harmful than others. However, current EU regulation bans snus (except in Sweden), but permits the marketing of highly toxic varieties of chewing tobacco - in particular those from India. In Sweden, snus is manufactured and stored in such a way as to cause it to deliver lower levels of some harmful chemicals found in other tobacco products. 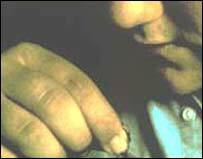 Unlike most forms of snuff, it is not snorted up the nose, but placed behind the upper lip. Research has shown that snus - and some US smokeless tobacco products - are at least 90% less hazardous than cigarette smoking. It has also shown that in Sweden the high use of snus has contributed to a low rate of cigarette smoking in men - and thus a low rate of smoking-related death in the country. Snus is still addictive, but almost a third of former male smokers use snus to help them give up. Writing in the journal, the researchers say: "For smokers who are addicted to nicotine, and cannot or will not stop, it is important that they can take advantage of much less hazardous forms of tobacco. "We argue that the ban on some of the least harmful forms of smokeless tobacco throughout the EU should be replaced by a regulatory framework applying to all smokeless tobacco products and focusing on eliminating those that are most harmful." This could be achieved by setting specific limits on the levels of cancer-causing agents in smokeless tobacco products, they say. Among the groups who took part in the research are the anti-smoking charity Action on Smoking and Health, Cancer Research UK, and the Institute for Tobacco Studies in Stockholm. However, another group of US public health researchers remain unconvinced, and suggest, in an accompanying commentary, that the evidence presented in favour of snus is flawed. They say there is little evidence that these products prevent smoking or help smokers to quit. The growth in smokeless tobacco use in both Sweden and the US occurred largely among young men, they say, but smoking in Sweden has been declining rapidly among women and older men.